A Coriolis meter works on Coriolis Effect, hence it is named so. Coriolis meters are considered to be true mass meters since they tend to measure the mass rate of flow directly while other flowmeter technologies measure volumetric flow. Since mass does not change, no adjustments are needed for varying fluid characteristics. Hence, a Coriolis meter operates in linear fashion. These types of meters exist in variety of designs. The flow is guided into the U-shaped tube. 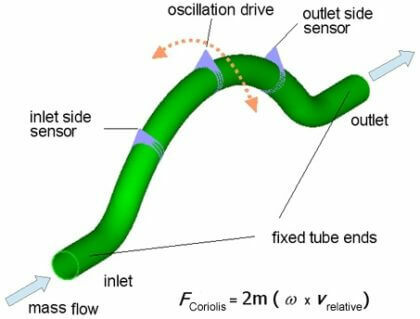 When an oscillating excitation force is applied to the tube causing it to vibrate, the fluid flowing through the tube will induce a rotation or twist to the tube because of the Coriolis acceleration acting in opposite directions on either side of the applied force. For example, when the tube is moving upward during the first half of a cycle, the fluid flowing into the meter resists being forced up by pushing down on the tube. On the opposite side, the liquid flowing out of the meter resists having its vertical motion decreased by pushing up on the tube. This action causes the tube to twist. When the tube is moving downward during the second half of the vibration cycle, it twists in the opposite direction. This twist results in a phase difference (time lag) between the inlet side and the outlet side and this phase difference is directly affected by the mass passing through the tube. An advantage of Coriolis flow meters is that it measures the mass flow rate directly which eliminates the need to compensate for changing temperature, viscosity, and pressure conditions. A more recent single straight tube design is available to measure some dirty and/or abrasive liquids that may clog the older U-shaped design. ‘U’ and ‘Ω’ shaped coriolis meters cause pressure drop as the flow is increased, resulting in permanent pressure loss. Consequently, liquids near boiling point could introduced cavitation as the pressure across the meter drops below the vapour pressure of the liquid (forming of vapour bubbles). As soon as the pressure recovers above the vapour pressure the bubbles impode. Cavitation will cause the meter to malfunction and this should be avoided at all times. The cross-section of the tube is normally smaller than the cross-section of the line pipe to increase the velocity (v) in order to create higher Coriolis forces. The latter holds good for Coriolis meters with straight measuring tubes as well. Consequently, the pressure drop will increase accordingly. Coriolis mass flow meters will measure the mass flow rate and actual density accurately irrespective of the nature of the fluid as long as the flow is single phase and the fluid is homogeneous. Being accurate, they are often used for custody transfer and critical reactor feed (ratio) control and also in streams where large variation in fluid composition will occur, which otherwise could not be measured. A weak point is their requirement for Zero Adjustment at operation conditions. the zero adjustment is easily upset by not fully stress free installation of the meter. where x varies between 0.1 and 0.3% depending on design of the meter. A Coriolis meter can be applied for variety of applications ranging from adhesives and coatings to liquid nitrogen. Typical rangeability of curved tube designed Coriolis meters vary from 100:1 to 200:1 whereas for straight-tube meters its rangeability is limited i.e. about 30:1 to 50:1. Besides, accuracy of straight tube meters is low. In case of Coriolis meters, no compensation is needed for temperature and pressure variations. Also mass measurement is insensitive to changes in viscosity and density. They are particularly helpful for handling liquids whose viscosity changes according to velocity while temperature and pressure remains constant. These are called universal meters, since they are capable enough to measure nearly all liquids, slurries and gases. They can measure all liquid flows such as Newtonian, non-Newtonian and moderately dense gases as well. They can be employed to measure liquid density also. No Reynolds number restrictions are allied with Coriolis flow meters. They are also not affected by deformations in velocity profile. Coriolis flow meter is capable of measuring a wide range of fluids that are often incompatible with other flow measurement devices. The operation of the flow meter is independent of Reynolds number; therefore, extremely vicious fluids can also be measured. A Coriolis flow meter can measure the flow rate of Newtonian fluids, all types’ non-Newtonian fluids, and slurries. Compressed gases and cryogenic liquids can also be measured by some designs. Coriolis flow meters provide a direct mass flow measurement without the addition of external measurement instruments. While the volumetric flow rate of the fluid will vary with changes in density, the mass flow rate of fluid is independent of density changes. Coriolis flow meters have outstanding accuracy. The base accuracy is commonly on the order of 0.2%. In addition, the flow meters are linear over their entire flow range. The rangeability of flow meters is usually on the order of 20:1 or greater. Coriolis flow meters have been successfully applied at flow rates 100 times lower than their full scale flow rate. A Coriolis flow meter is capable of measuring mass flow rate, volumetric flow rate, fluid density and temperature — all from one instrument. The operation of the flow meter is independent flow characteristics such as turbulence and profile. Therefore, upstream and downstream straight run requirement and flow conditioning are not necessary. They can also be used in installations that have pulsating flow. Coriolis flow meters do not have internal obstructions witch can be damaged or plugged by slurries or other types of particulate matter in the flow stream. Entrained gas or slugs of gas in the liquid will not damage the flow meter. There are no moving parts witch will wear out require replacement. These design features reduces the need for routine maintenance. The flow meter can be configured to measure flow in either the forward or the reverse direction. In revere flow there will still be a time or phase difference between the flow detector, but the relative difference between the two detector signals will be reversed. Coriolis flow meter designs are available witch allow for use in sanitary applications, and for the measurement of shear sensitive fluids. Materials are available to permit the measurement of corrosive fluids. Coriolis flow meters are not available for large pipelines. The largest Coriolis flow meter that is currently available has a maximum flow rating of 25,000 lb/min (11,340 kg/min), and is equipped with 6 in. (15 cm) flanges. When larger flow rates must be measured, two or more flow meters mounted in parallel are required. Some flow meter designs require extremely high fluid velocities in order to achieve a significant amount of time or phase difference between the flow detector signals. This can result in extremely high pressure drops across the flow meter. Coriolis flow meters are expensive. However, the cost of a Coriolis meter is often comparable to (or below) the cost of a volumetric meter plus densitometer used together to determine the mass flow rate. Coriolis flow meters have difficulty measuring the flow rate of low- pressure gas. Application with pressure less than 150 psig are marginal with the flow meter designs that are currently available. Low-pressure gases have low density, and their mass flow rate is usually very low. In order to generate enough mass flow rates to provide sufficient Coriolis force to be measured, the gas velocity must be extremely high. This in turn may lead to prohibitively high pressure drops across the meter. Also Read: What is an Orifice meter ?